Although RHA is more than adept at making wired in-ear headphones, its first pair of wireless earphones feel like a misstep. From the weak, mushy sound, to a form-factor that doesn’t quite come together alongside an uncomfortable fit, the MA750 Wireless don’t offer an experience that’s on a level with their premium price tag. There was a time when anyone who cared about sound quality would have laughed you out of the room if you said you were going to buy a pair of wireless headphones. In those early days the reality was that Bluetooth simply couldn’t carry enough data to deliver a satisfying audio experience, and the result was weak, mushy sound that paled in comparison to what you’d get over a wired connection. Make no mistake, the RHA MA750 Wireless headphones aren’t nearly as bad as that first generation of wireless headphones, but neither do they feel like they’ve kept pace with how good wireless headphones have gotten recently. Especially at the budget end of the spectrum. First impressions of the RHA MA750 Wireless are pretty good. The earbuds themselves are made out of metal, which inevitably lends them a nice premium feel. Since these headphones are wireless, their battery needs to be stored somewhere. Where other wireless earphones like the Beats X store their batteries in little units along an otherwise slimline cable, the MA750s choose to embrace the bulk added by their battery, leading to a cable that’s halfway between a neckband (like the one seen on the Bose QC30) and a normal cable. Much like the neckbands seen on other headphones, this bulky cable is a love it or hate it affair. We weren’t too bothered by it overall, but others in the office took a little more umbrage. We were pleased to discover that the headphones make use of a USB-C port for charging. Around the earphones is a stiffened bit of cabling that’s designed to hook over the top of your ear and make the headphones feel a little more secure. It took us a little bit of time to work out how to hook this cabling over our ears without it feeling like the height of our ear was going to pull the earphone out, but once we got the knack of it it wasn’t too much of a problem. Unfortunately this stiff cabling means the earphones never hang very well around your neck. Ostensibly the magnetized earpieces should mean that the headphones hang neatly together, but the curve in their wires means they’re forever hanging weirdly away from your body. The earphones never hang very neatly from your neck. One final feature worthy of note is that the neckband vibrates when the phone it’s connected to receives a phonecall, which could potentially be a useful feature if you’re in the habit of leaving your phone in a bag or somewhere where you can’t hear it. Battery life is a respectable 12 hours, which is much better than most of the wireless in-ear competition. While in recent years the biggest problem with cheaper headphones is an overwhelming level of bass, the RHA MA750s suffer from almost the polar opposite problem. There’s just not enough bass here. Songs like Cecilia Ann by the Pixies feel flat and lifeless with their bass notes buried in the mix, and on more than one occasion we were convinced we didn’t have the earphones seated in our ears properly because of the lack of bass. Moving to some pop punk and the lack of punch in the low-notes robs songs of even more of their vibrancy. All of the parts of Green Day’s Welcome to Paradise are present when listened to through these headphones, but it lacks the richness that a more rounded bass response would deliver. Although mid and treble response doesn’t suffer from this same absenteeism, the fact that it’s more audible exposes the lack of detail in the headphones. The sound of the MA750s can have a mushy edge to it, and a song like June by RJD2 ends up lacking the detail that you’d find when listening with different headphones. We’ll get right to the point: despite their solid build quality and exceptional battery life, there are better wireless earphones out there that are much cheaper to boot. The lack of bass on the RHA MA750 Wireless is especially unfortunate, and the absence of much detail in the mids and highs combines to create an overall sound that doesn’t lead to a very exciting listen. 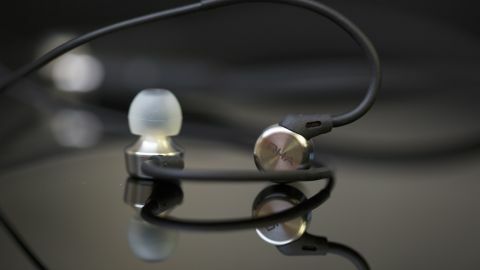 If you simply must have a pair of wireless earphones that feature a sleek metal construction and great battery life, then the MA750s are probably not for you. Instead check out our guide to the best wireless earbuds for a complete list of the best alternatives out there.